Why pay for large amounts of scaffolding to inspect the exterior facade of buildings, when you can call on our experienced team of Abseiling Tradespeople to carry out difficult access survey works to your property and provide you with solutions to any issues found to be of concern. Industrial Rope Access Survey is one area in which Advanced Solutions Group can provide you with very cost effective services when compared with other traditional access methods to carry out surveys to the exterior facades of buildilngs. Call us today on 1300 789 474 to see how we can assist you with our Rope Access Survey services and provide you quotations on whatever remedial works are necessary to rectify any issues of concern. 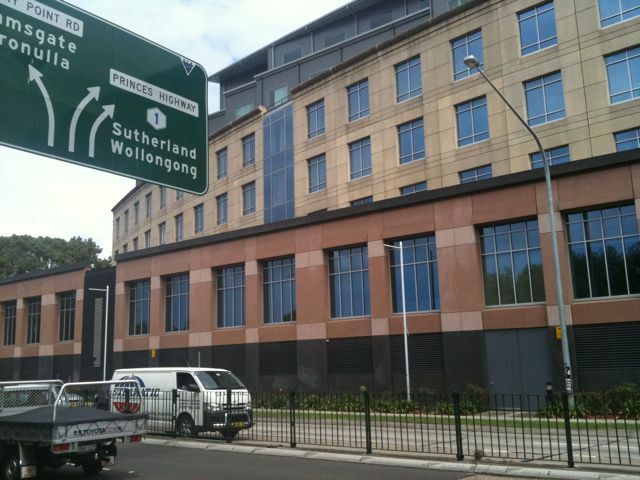 We have undertaken thousands of projects throughout Australia which have required specialist difficult access expertise. Many of our clients had been told that “it simply could not be done”, until we arrived onsite to provide them with an obligation and cost free quote. 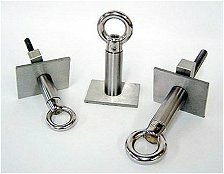 Many of the people we speak to have been through a long list of trade services prior to finding us and are amazed at the kind of work we are able to do. Click Here to see our staff, conducting vital maintenance to ANZ Stadium!!! We are proud of the projects we have undertaken and are proud to have such an experienced and professional team. We would love to assist you with any difficult access projects you may have… or even just general building services as we operate a building services division also. Call us today on 1300 789 474 to discuss our services. Advanced Solutions Group – Challenge Us……We look forward to it!!! Building and Facade Maintenance are areas in which Advanced Solutions Group Pty Ltd provide services and have a healthy portfolio of prominent clients throughout the building services, property management (industrial, commercial & residential) as well as construction companies throughout Australia. We are often called in to undertake works to the facades of buildings where scaffolding or lifting equipment would be needed (costing alot of money) or where these traditional access methods simply cannot get to (difficult access). We have experience, qualified personnel who can help you save money and achieve a positive project outcome for all types of building maintenance via Industrial Rope Access or Abseiling. Call us today to find out how we can assist with your Facade Maintenance project! Challenge us…. we look forward to it!!! Our expert team of industrial rope access personnel have successfully completed rope access window cleaning at St George hospital requiring our team to abseil the exterior facade to clean all external windows. This cost savings rather than usung the BMU has provided the hospital with a cost effective means to clean the windows. If you would like a quote for our rope access window cleaner to clean your windows please contact us below or go to our web site. 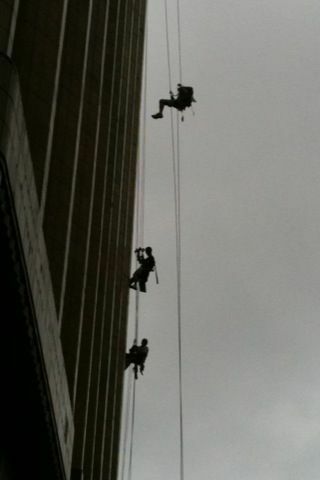 Industrial Rope Access Painting is the most cost effective way of painting a difficult to reach area of any building. Where you would normally need to hire scaffolding to carry out painting and other high reach painting work, abseil painting is far more flexible and economical as a means to achieve a high quality painting project. We regularly paint entire buildings by rope access and are proud to be engaged ahead of painters who would otherwise use scaffolding or lifting equipment to carry out their works. 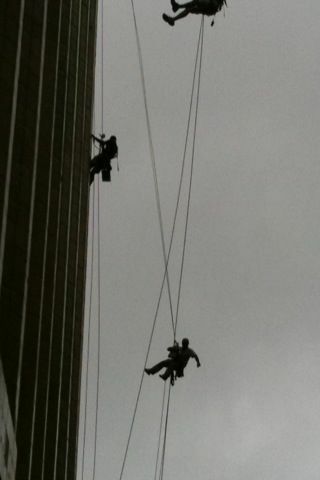 Our clients are always surprised at how quickly, efficiently and cost effectively we can carry out a painting project via abseiling and we feel a great sense of satisfaction knowing that our highly skilled personnel are able to do this consistently. The benefits of rope access are clear and are significant in terms of OHS & cost effective access. Call Advanced Solutions Group today on 1300 789 474 to see how we can assist with your painting project. Challenge us….. we look forward to it!!! Our team has successfully squires window cleaning at 53 martin pl that required remedial repairs for the work to be carried out. Recently, we have undertaken Industrial Rope Access Facade Maintenance works at a prominent CBD building, which was built several decades ago when building codes allowed for windows to be open and shut on multi storey properties. The owners of the building had concerns regarding the OHS issues surrounding having openable windows at height and also had a handful of windows which had rusted at the hinge & were causing concerns as to whether they would fall to the street below. The owners realised they needed an emergency repair and called us to offer solutions. 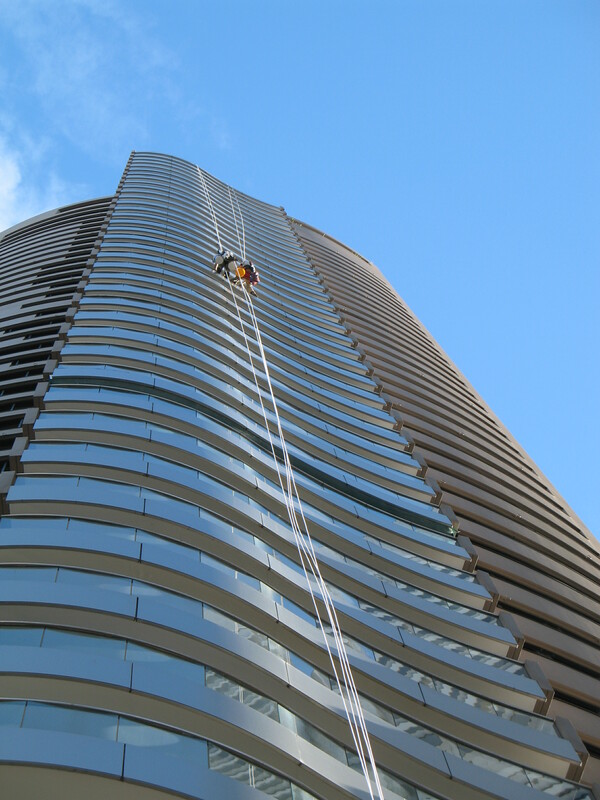 Our expert abseil team were onsite the same day, and were able to reglaze and re-hinge the handful of windows that threatened to detach from the building – much to the client’s delight. We then undertook a Rope Access Survey, which revealed the extent of damage and wear to the existing windows on the 14 storey building. Many windows were in bad shape in addition to being able to be opened. The aluminium frames on many of the windows at the property had warped and worn over the years, causing many cracks to window panels as well as developing rust issues which would over time, escalate the threat of windows falling from the structure. Our rope access team provided a detailed report on the locations and numbers of problems identified at the property and provided a series of quotes, aimed at accommodating for the client’s budgetary requirements and also a task list in order of OHS & aesthetic priority. We are about to commence works to the property to replace all the cracked glass panels and also to permanently close every window on the 14 storey building. We are proud to provide this solution to our valued client and look forward to commencing these works. Stay tuned for updates on this project’s outcome!!! 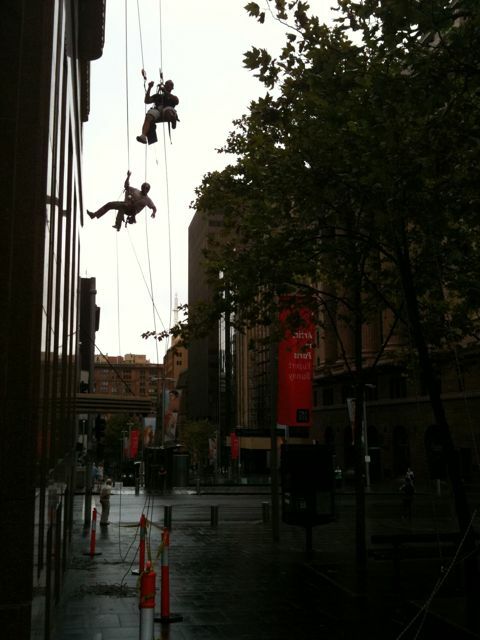 We currently have several Industrial Rope Access Painting projects going on around Sydney and beyond. Our highly skilled abseiling technicians are able to offer high quality painting services at a reduced cost in comparison with lifting equipment and scaffolding. Find out how we can help you cut the cost of your painting job.